This form is to help you calculate your 2019 NNA Dues. Some simple notes you need to know before filling out this form. Dues are calculated on frequency and total circulation. Do not include commas or periods to denote thousands. For example, type 1000, not 1,000. Boxes on the right hand side of the form will automatically be calculated for you. Online Newspaper membership fee is a flat $500. 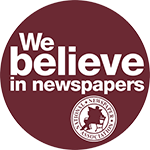 Single-title newspapers with circulation less than 1,000 membership fee is a flat $130. Please fill every box. If the field does not apply, enter a zero. Contributions of gifts to NNA are not deductible as charitable contributions for federal income tax purposes. Dues payments may be deductible by members as an ordinary and necessary business expense except to the extent they are used for lobbying purposes. For lobbying purposes, 19 percent of your dues are not tax deductible.